Bibi ka alam procession on elephant in Dabirpura, Old City (Hyderabad, India). Muḥarram (Arabic: مُحَرَّم‎) is the first month of the Islamic calendar. It is one of the four sacred months of the year during which warfare is forbidden. It is held to be the second holiest month, after Ramaḍān. Since the Islamic calendar is a lunar calendar, Muharram moves from year to year when compared with the Gregorian calendar. The tenth day of Muharram is known as the Day of Ashura, part of the Mourning of Muharram for Shia Muslims and a day of fasting for Sunni Muslims. The practice of fasting during Ashura stems from the hadith that Musa (Moses) and his people obtained a victory over the Egyptian Pharaoh on the 10th day of Muharram; accordingly Muhammad asked Muslims to fast on this day and on the day prior, the Day of Tasu'a. Shia Muslims mourn the death of Ḥusayn ibn ʿAlī and his family, honoring the martyrs by prayer and abstinence from joyous events. Shia Muslims do not fast on the 10th of Muharram, but some will not eat or drink until zawal (afternoon) to show their sympathy with Husayn. In addition there is an important ziyarat book, the Ziyarat Ashura about Husayn ibn Ali. In the Shia sect, it is popular to read this ziyarat on this date. The sighting of the new moon ushers in the Islamic New Year. The first month, Muharram, is one of the four sacred months mentioned in the Quran, along with the seventh month of Rajab, and the eleventh and twelfth months of Dhu al-Qi'dah and Dhu al-Hijjah, respectively, immediately preceding Muharram. During these sacred months, warfare is forbidden. Before the advent of Islam, the Quraish and Arabs also forbade warfare during those months. Muharram is a month of remembrance and modern Shia meditation that is often considered synonymous with Ashura. Ashura, which literally means the "Tenth" in Arabic, refers to the tenth day of Muharram. It is well-known because of historical significance and mourning for the murder of Ḥusayn ibn Ali, the grandson of Muhammad. Shia's begin mourning from the first night of Muharram and continue for ten nights, climaxing on the 10th of Muharram, known as the Day of Ashura. The last few days up until and including the Day of Ashura are the most important because these were the days in which Husayn and his family and followers (including women, children and elderly people) were deprived of water from the 7th onward and on the 10th, Husayn and 72 of his followers were killed by the army of Yazid I at the Battle of Karbala on Yazid's orders. The surviving members of Husayn’s family and those of his followers were taken captive, marched to Damascus, and imprisoned there. 1 Muharram: Seizure of the Grand Mosque in 1400 AH (1979 AD). 2 Muharram: Husayn ibn Ali enters Karbala and establishes camp. Yazid's forces are present. 61 AH (680 AD). 5 Muharram: Death anniversary (urs) of Baba Farid, a Punjabi Sufi saint, in 665 AH (1266 AD). 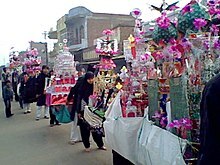 His urs is celebrated for six days during Muharram, in Pakpattan, Pakistan. 7 Muharram: Access to water was banned to Husayn ibn Ali by Yazid's orders. 61 AH (680 AD). 10 Muharram: Referred to as the Day of Ashurah (lit. "the Tenth"), the day on which Husayn ibn Ali was martyred in the Battle of Karbala. Shia Muslims spend the day in mourning, while Sunni Muslims fast on this day, commemorating the rescue of the people of Israel by Musa (Moses) from Pharaoh. Many Sufi Muslims fast for the same reason as the Sunnis mentioned above, but also for the martyred dead in Karbala. 15 Muharram: Birth of Muhammad Sirajuddin Naqshbandi in 1297 AH (1879 AD). 25 Muharram: Zayn al-‘Ābidīn, fourth Shia Imam was martyred by Marvanian in 95 AH (714 AD). 28 Muharram: Death anniversary (urs) of Ashraf Jahangir Semnani, an Indian Sufi saint, in 808 AH (1405 AD). Shia Muslims take out a Ta'ziya procession on Ashura in Barabanki, India, January 2009. ^ "Ashura of Muharram – A Shia and Sunni Muslim Observance". iqrasense.com. Retrieved 10 October 2015. ^ "ZIYAARAT ASHOORA IMP". www.duas.org. ^ "Muharram". 2010-12-08. Retrieved 2010-12-08. ^ Gent, R.H. van. "The Umm al-Qura Calendar of Saudi Arabia". www.staff.science.uu.nl. ^ Allama Majlisi. Bihar al-Anwar. 46. pp. 152–154. Chelkowski, Peter J. ed. 1979. Ta’ziyeh: Ritual and Drama in Iran. New York: New York University Press. Cole, Juan. 1988. Roots of North Indian Shiism in Iran and Iraq: Religion and State in Avadh, 1722-1859. Berkeley, CA: University of California Press. Kartomi, Margaret. 1986. ‘Tabut - a Shia Ritual Transplanted from India to Sumatra’, in Nineteenth and Twentieth Century Indonesia: Essays in Honour of Professor J.D. Legge, edited by David P. Chandler and M.C. Ricklefs, Australia: Monash University, Centre for Southeast Asian Studies, 141-162. Pinault, David. 1992. The Shiites: Ritual and Popular Piety in a Muslim Community. London: I.B. Tauris. "Muharram" . New International Encyclopedia. 1997.